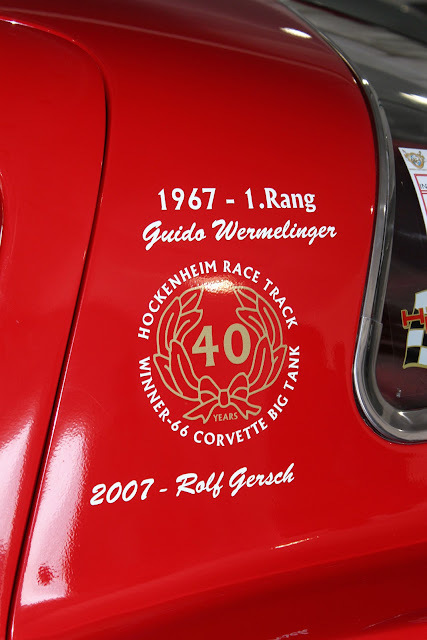 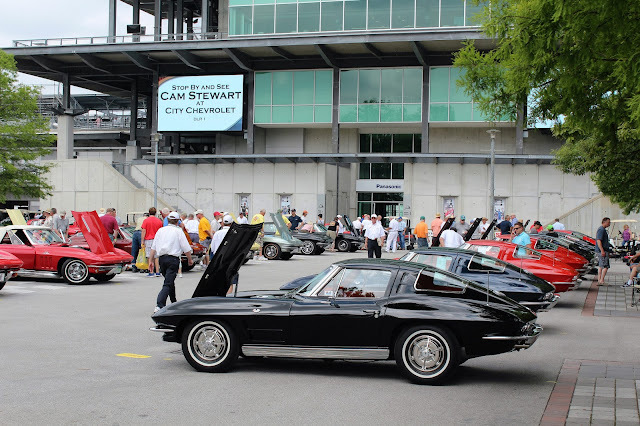 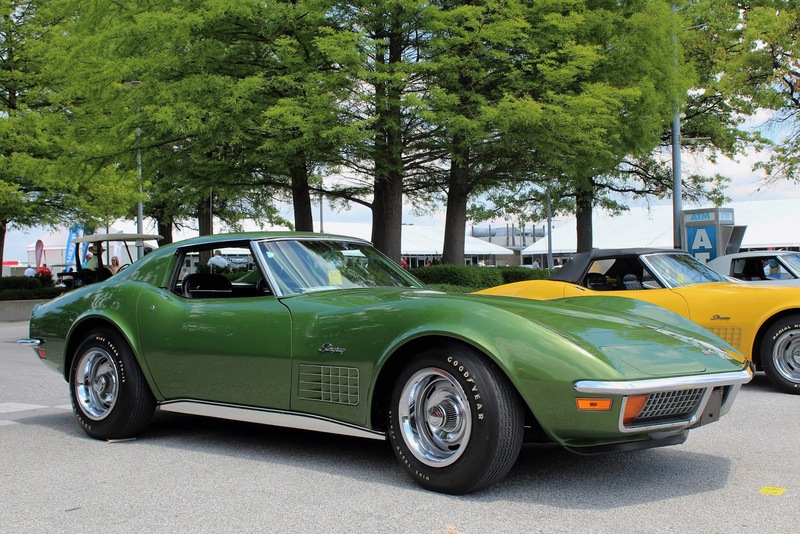 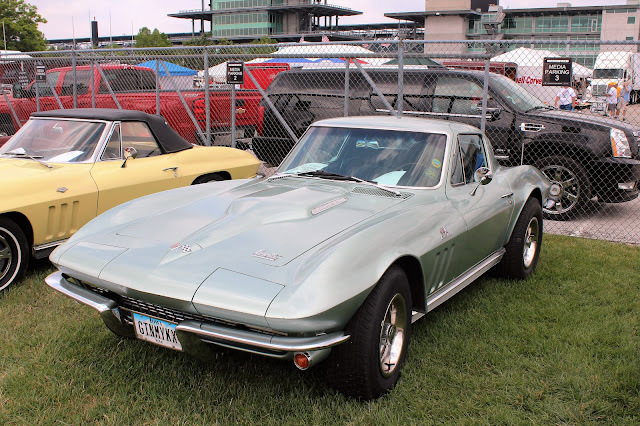 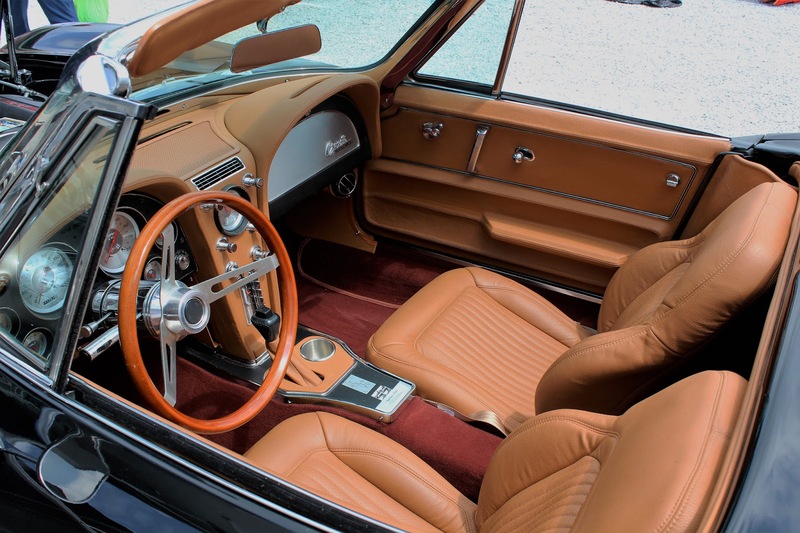 Beginning as a one-day show at the Bloomington, Indiana fairgrounds in 1972, Bloomington Gold has grown over the decades as the longest-running all-Corvette event in the United States. 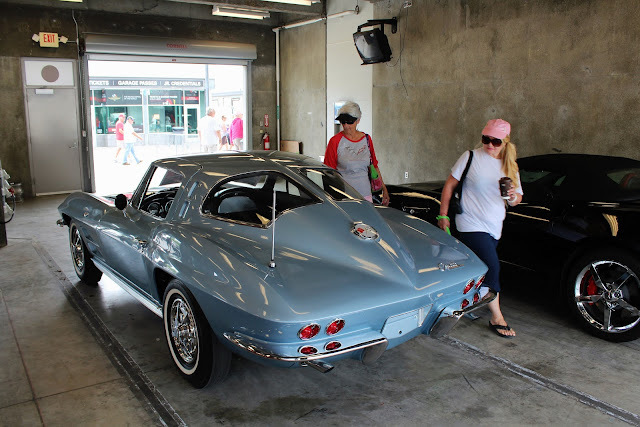 It has changed locations and owners a number of times, as well as its format. It has now relocated to the Indianapolis Motor Speedway each June and runs for three days, attended by over 30,000 people. There is the opportunity to have your Corvette judged by NCRS experts to receive the hallowed "Bloomington Gold Certification" as a top-quality authentic vehicle; there are many vendors, selling everything from clothing and jewelry to parts to complete Corvettes; there are educational seminars; there is an autocross course; and, of course, the chance to do some parade-speed laps around the famous Speedway oval itself. 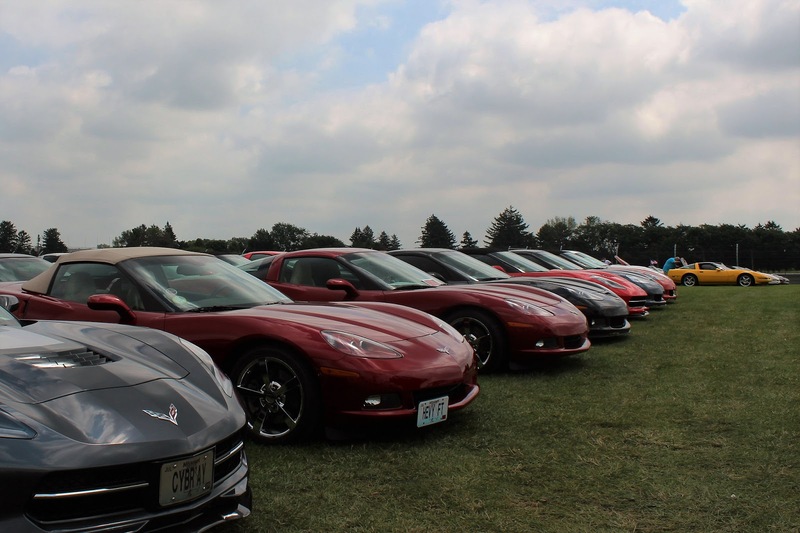 And hanging out with Corvette people is always fun. 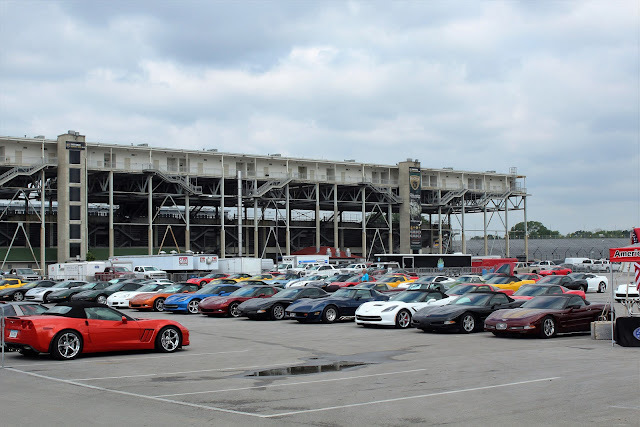 Driving to the Speedway was quite simple and the traffic into the venue was well-organized. As a member of the Facebook group "Simply Corvette," we had a special club parking area reserved and found it without too much trouble. We took the opportunity to speak to some others from the group (none of whom had actually met in person in this Digital Age). 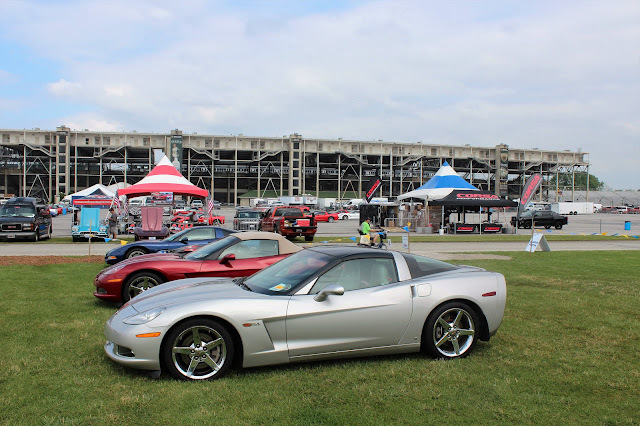 There was a gentleman from Rochester, New York, with a nice C5 who told us he was stopping at the event as part of a trip that would take him to the West Coast. It turned out that this would be his fifth time making the journey in his C5, which says a lot about Corvettes as travelling machines. 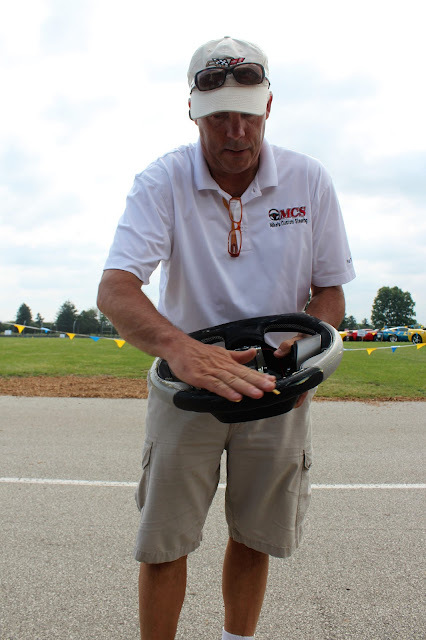 Across from our parking area were several vendors' tents and as I passed by I noticed that one of them was selling flat-bottomed, leather-wrapped replacement steering wheels. 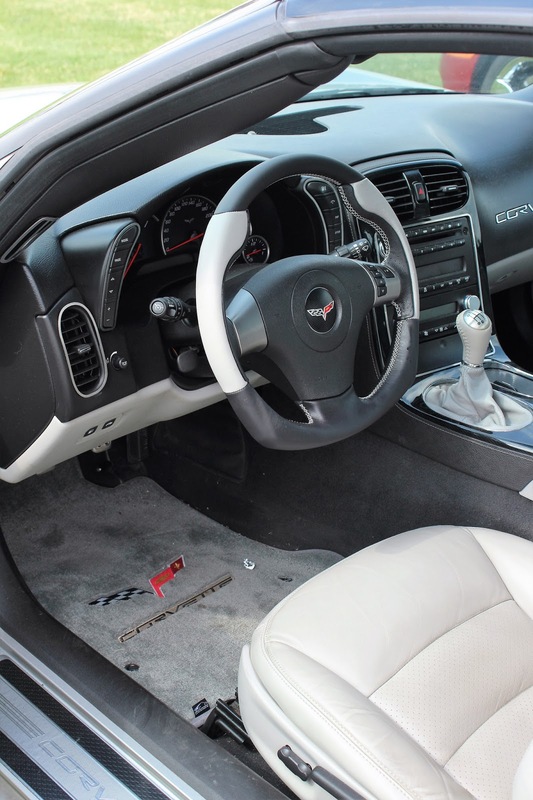 One of the criticisms of the C6 Corvette was that the steering wheel looked as if it came from the Chevy Cobalt economy car, although I understand that in fact it went the other way around! 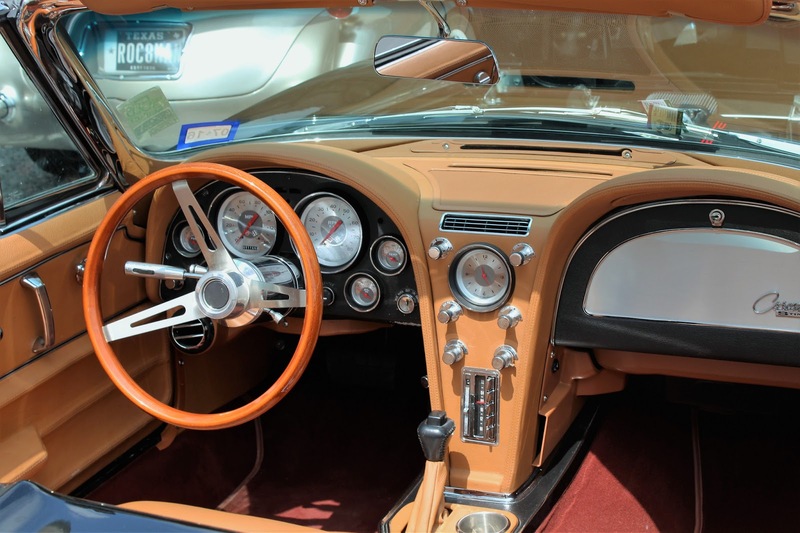 In any event, the replacement steering wheel looked great and as installation could be done on the spot I persuaded the vendor to stop his sales pitch and just sell me the darn thing! Not inexpensive but the steering wheel not only looks much better but is far more comfortable when driving on our long trips. Of the numerous bits of personalization we have done to the Corvette, this is one of the very best. 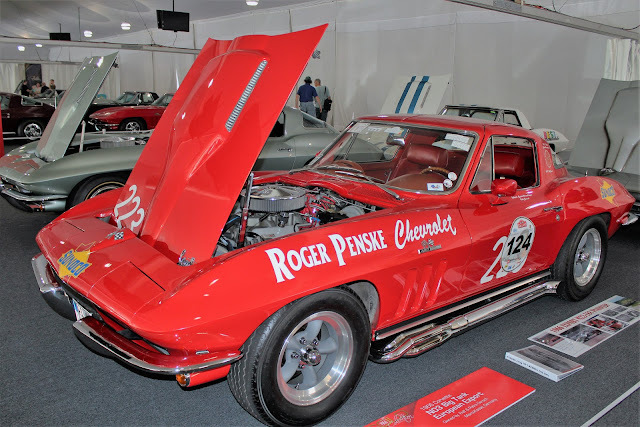 That bit of pricey business dealt with, it was time to walk around the show. 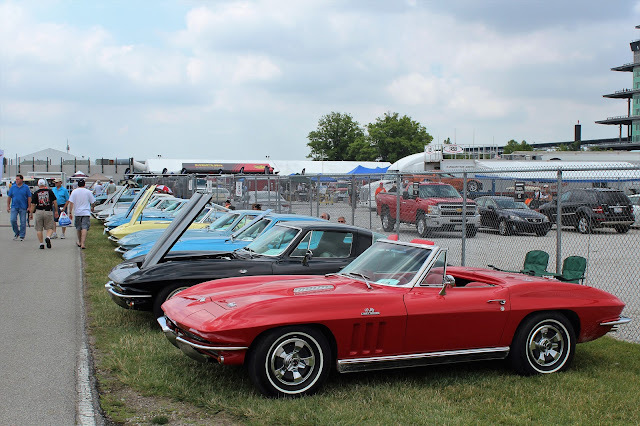 Of course, there were Corvettes as far as you could see even if the numbers were below what we had seen at Corvettes at Carlisle in 2015. 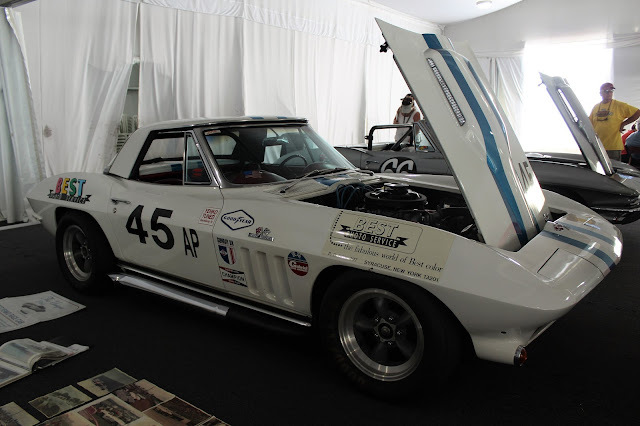 Nonetheless, it was quite impressive. 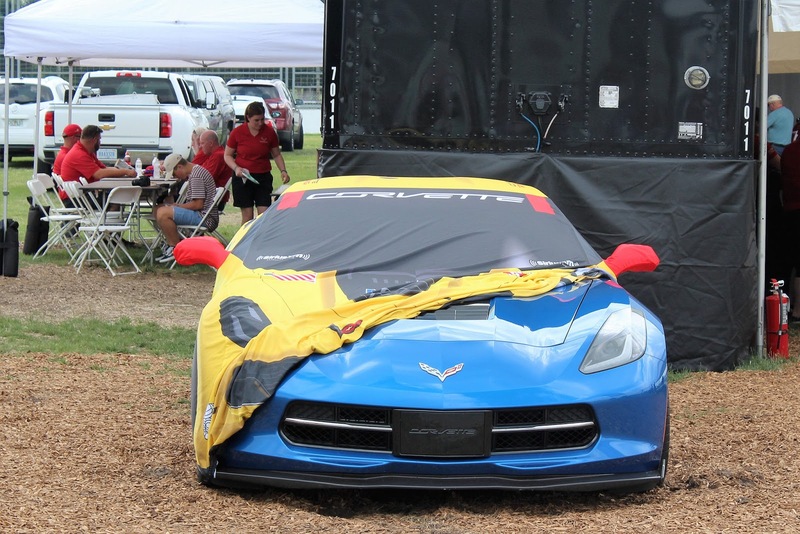 My favourite car cover ever! 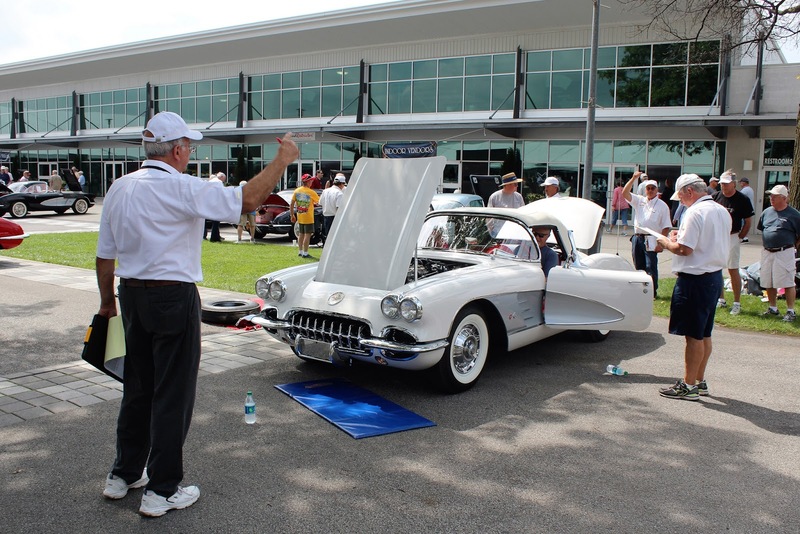 As is typical of a show of this type, there were many vendors exhibiting products and services. 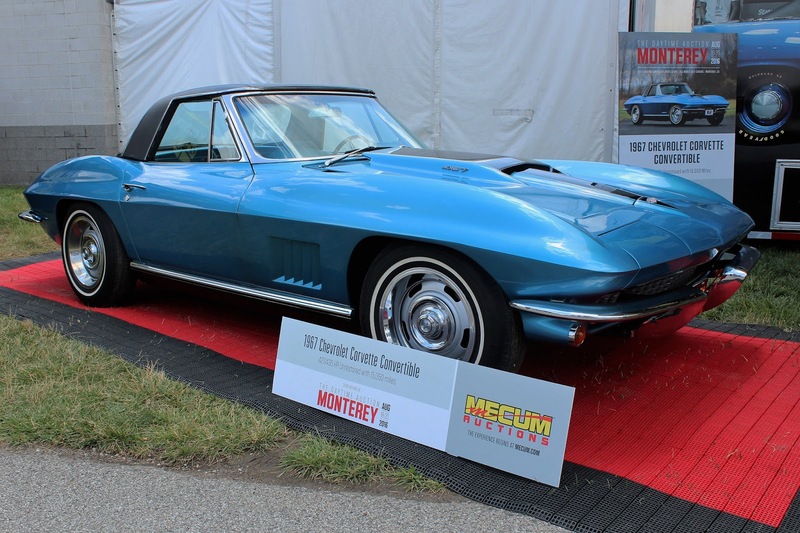 The Mecum auction people had two very nice mid-year Corvettes that were coming up for sale, and a dealer for Superformance replica cars had a full display, including a superb replica 1963 Grand Sport. 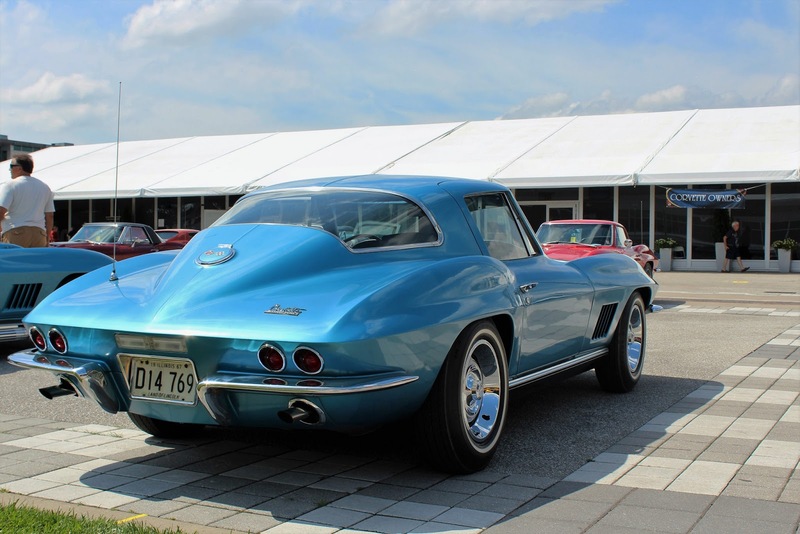 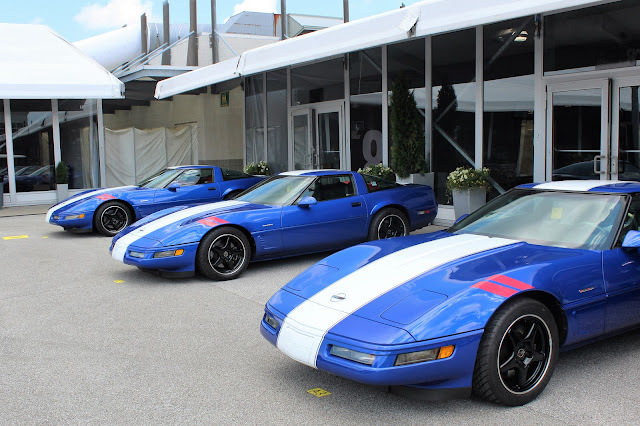 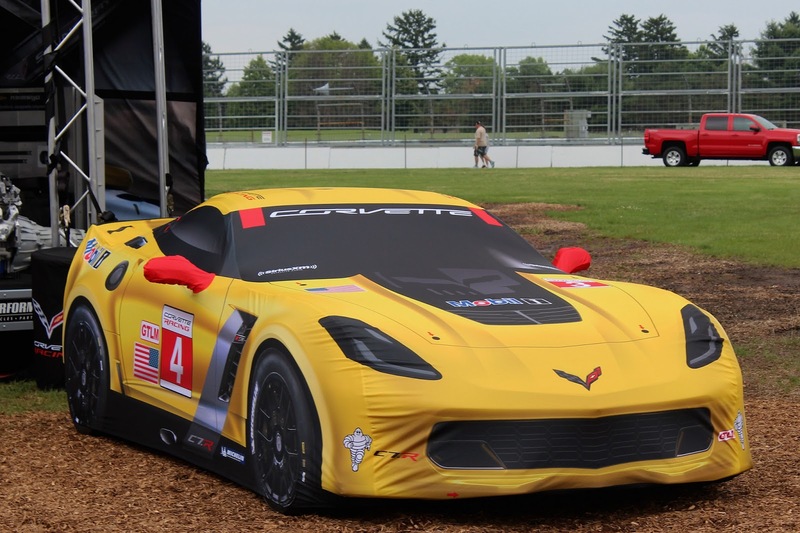 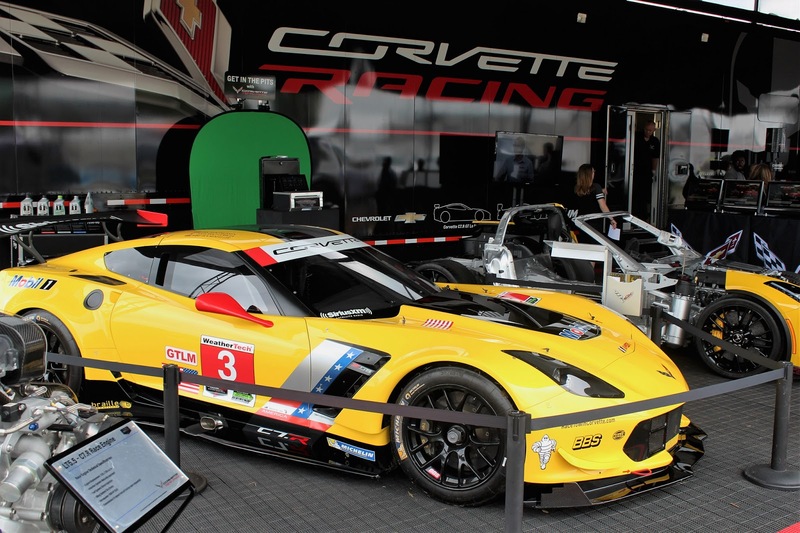 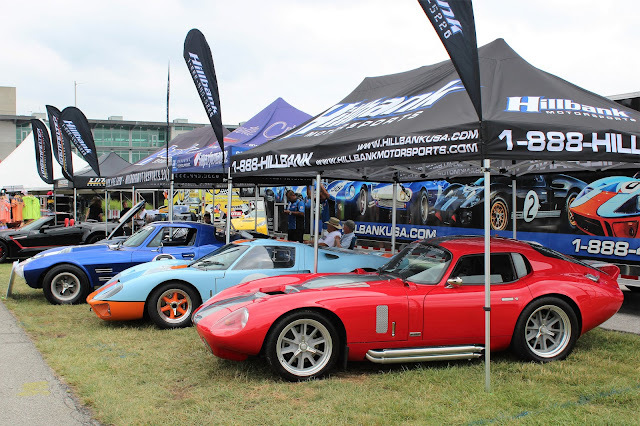 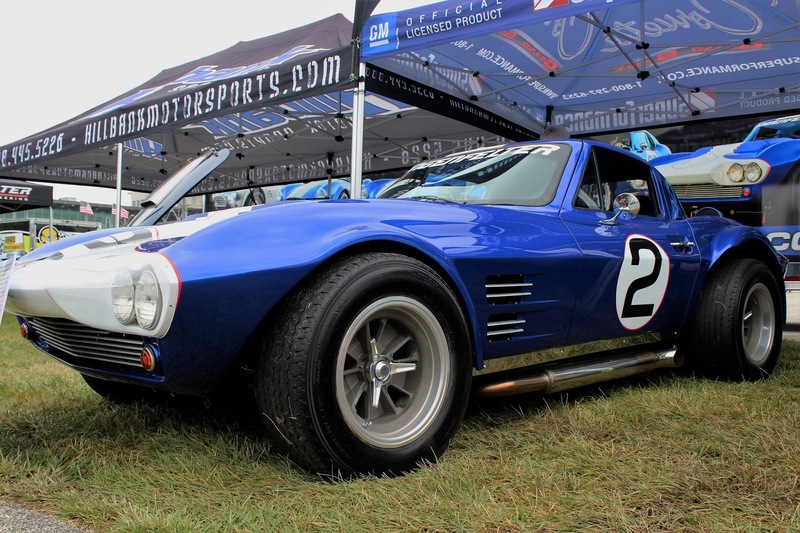 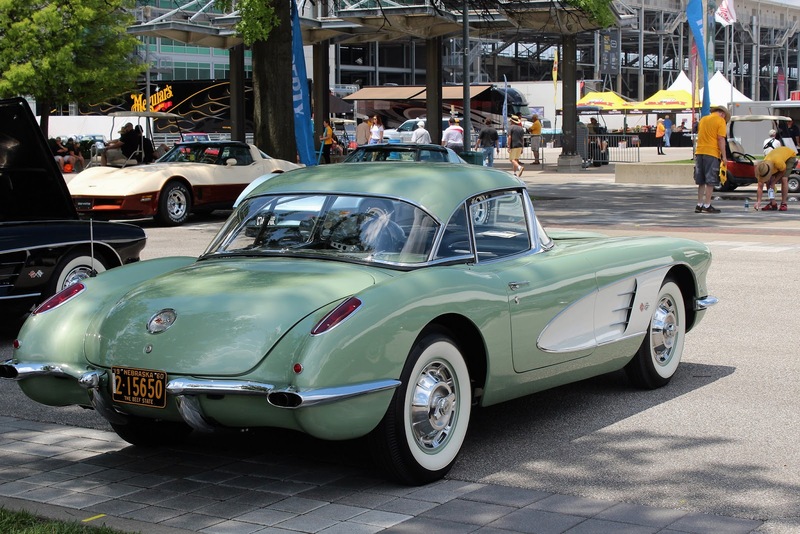 Another vendor that has long been into high-performance Corvettes was Callaway Cars, from Old Lyme, Connecticut. 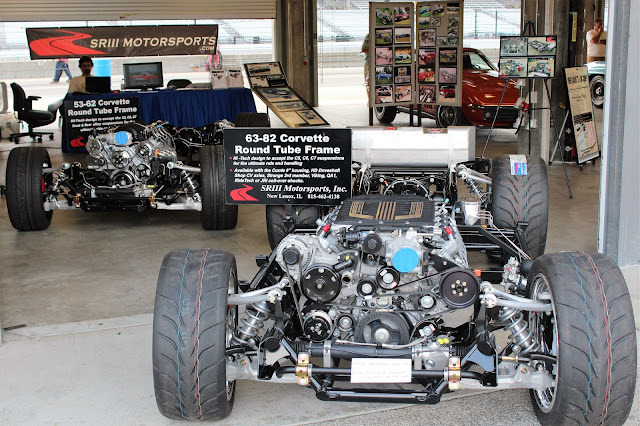 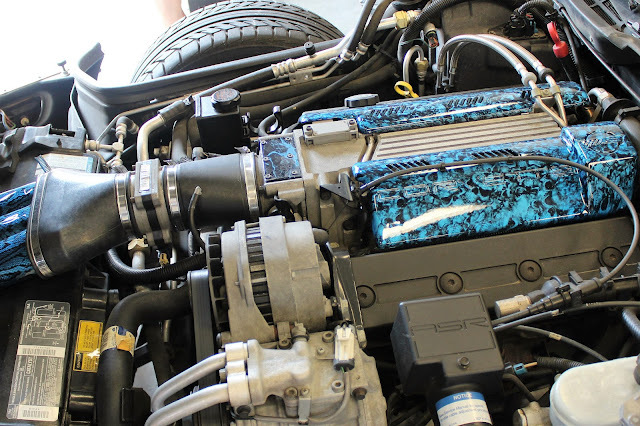 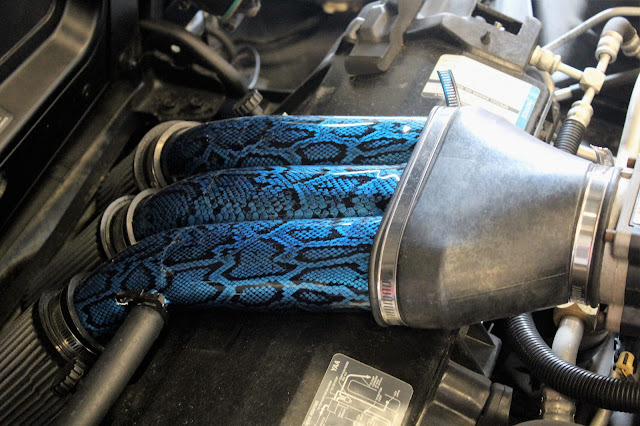 In addition to their massively powerful supercharged C7s, they had for sale their 2010 C6 SC606 company car that had been used to test components and which has over 258,000 miles on it, a clear demonstration of the durability of Corvettes, even with over 600 hp. 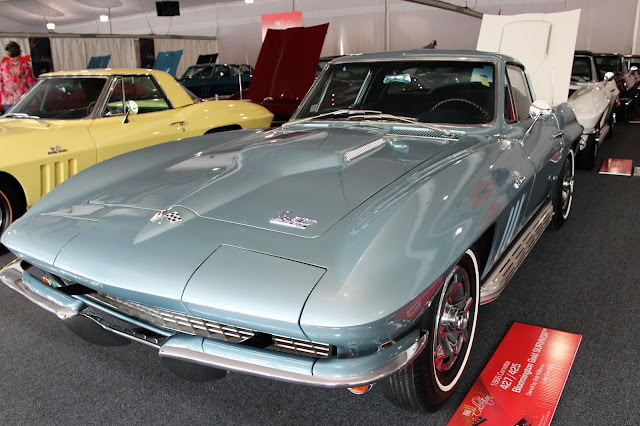 Unfortunately the current asking price of US$ 49,000 also indicates the Callaways hold their value. 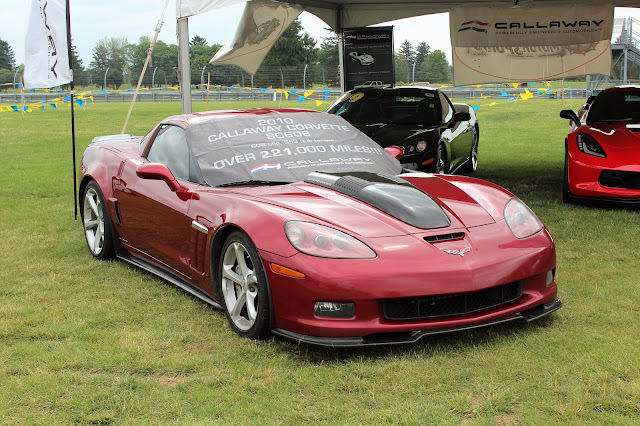 2010 Callaway SC606--still looking good with over a quarter-million miles on it now! 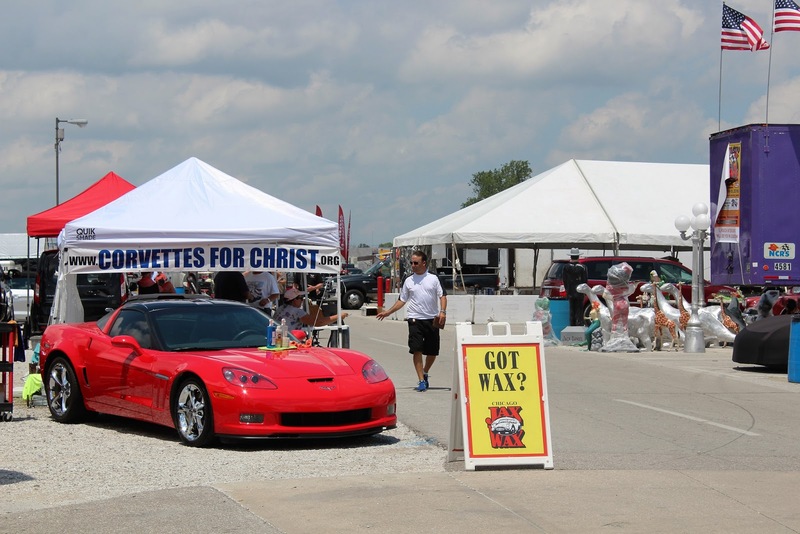 Continuing the vendor theme, there was a company with a display of crate engines to turn that tired Corvette into a road rocket; there were sellers of tired Corvettes and Corvette parts from all generations; and perhaps one of the most unusual vendors of all was the Evangelical minister behind Corvettes for Christ. 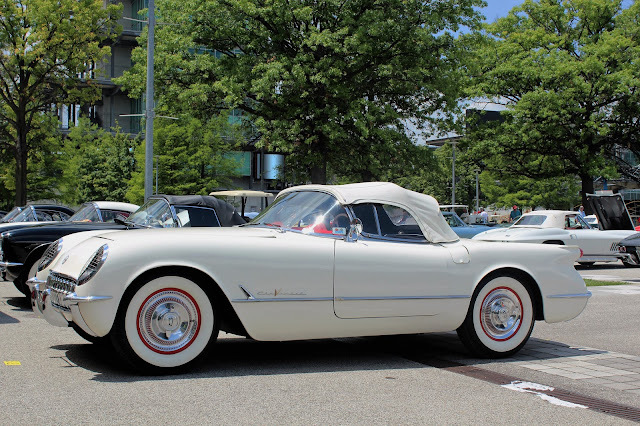 He does point out on his webpage that Corvettes will not actually be able to enter Heaven, sadly. One of the most impressive vendors was one from Texas who had brought a series of resto-modded cars: a 1957 Chevrolet, a 1960 Corvette and a pair of mid-year Roadsters. 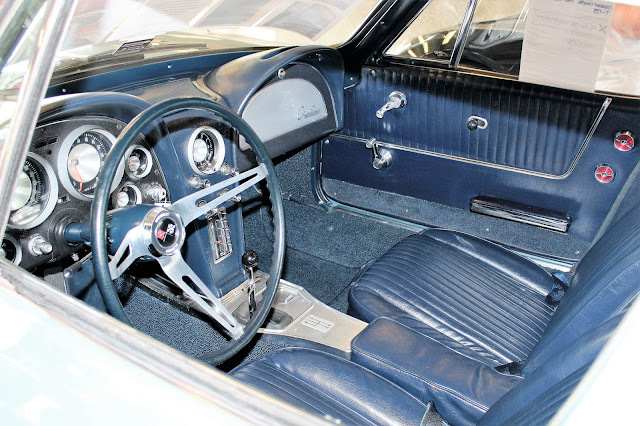 All had modern chassis and engines and the most beautiful interiors, far far above the original factory quality. 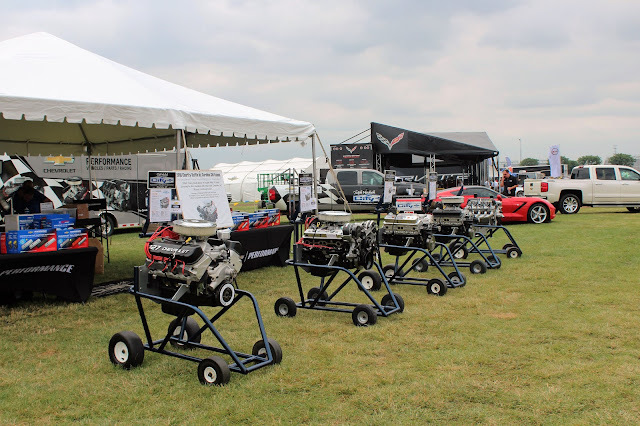 Another vendor specialized in painting components in any colour or pattern you would like and had some startling engine work on display. 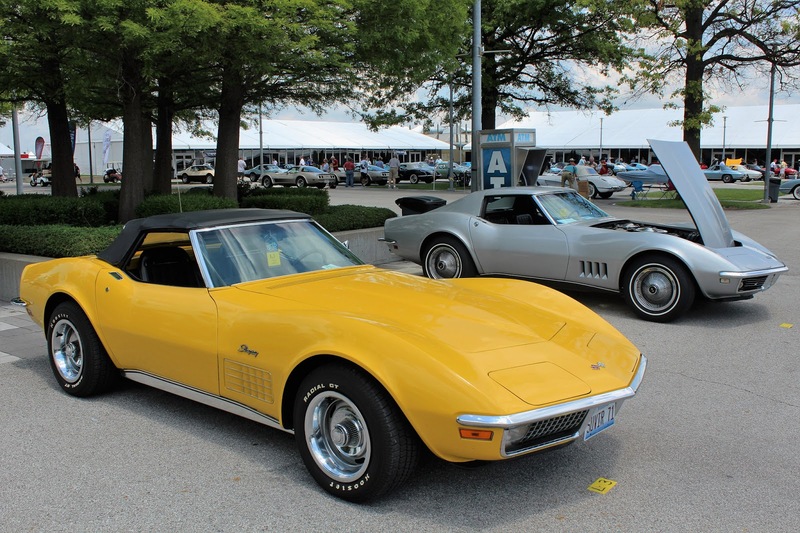 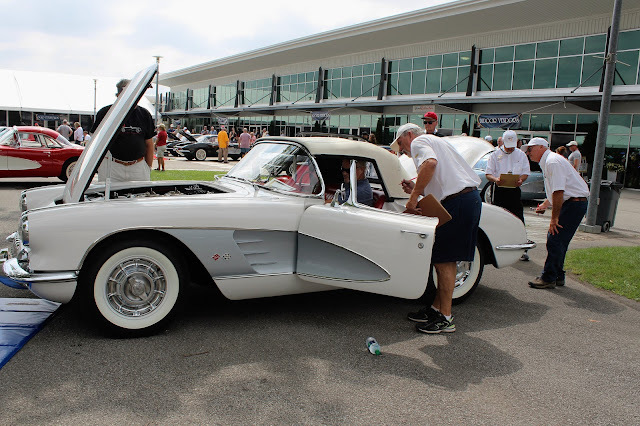 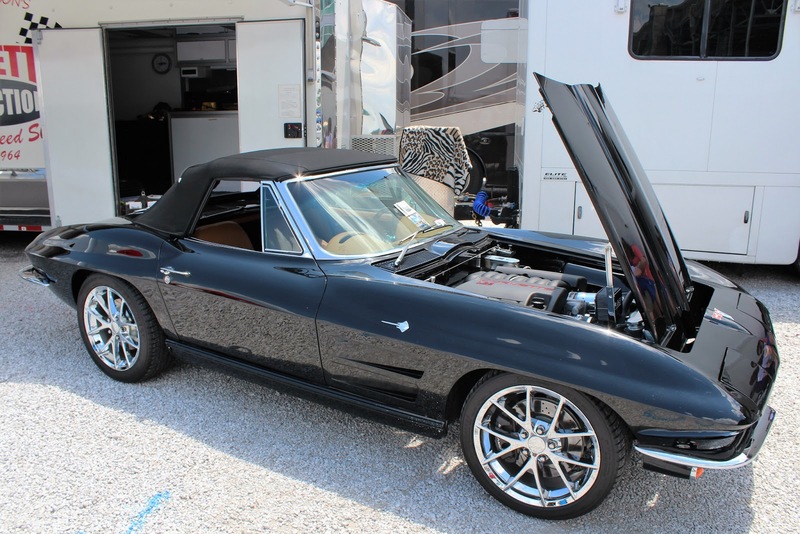 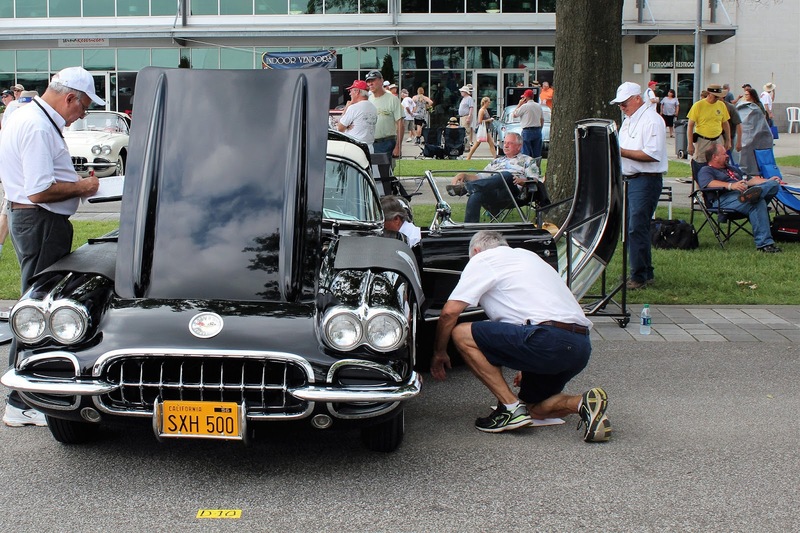 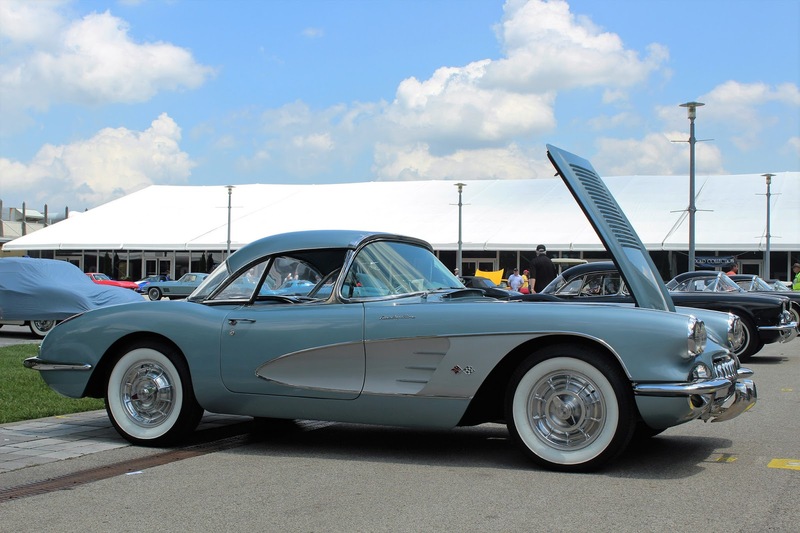 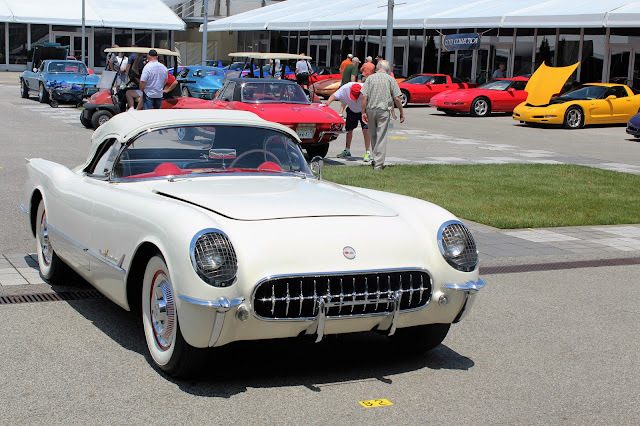 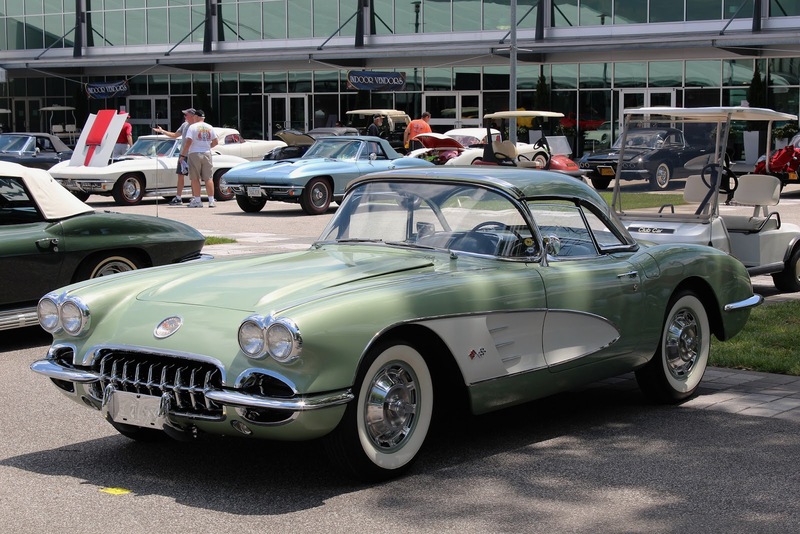 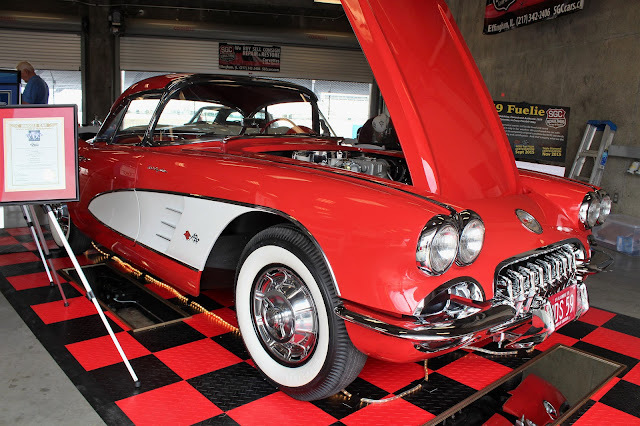 Considerable effort goes into the restoration, or improvement, of older Corvettes and vendors were there to fill every need. One of the vendors who was using one of the garages in the famous Gasoline Alley pits area of the Speedway offered modern chassis conversions and had several beautiful award-winning restorations on display as well. 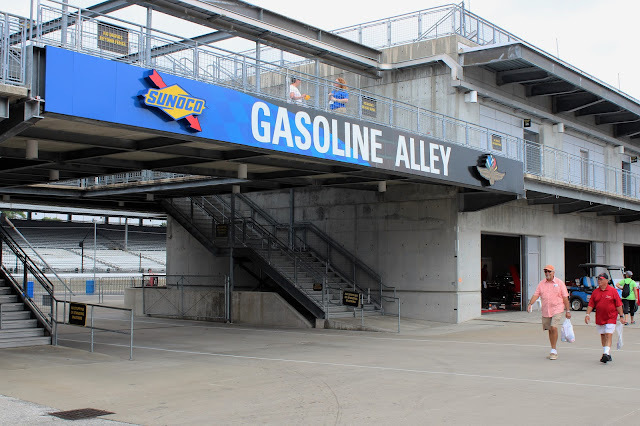 Gasoline Alley was the area where all the drivers who had signed up for some laps of the track assembled and waited to go out. 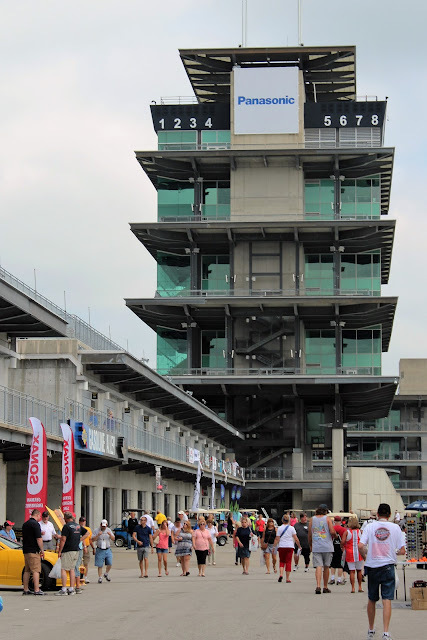 The track, which is 2.5 miles long (4.023 kms), is huge and driving past the empty grandstands, which can seat 200,000, made you feel very small. 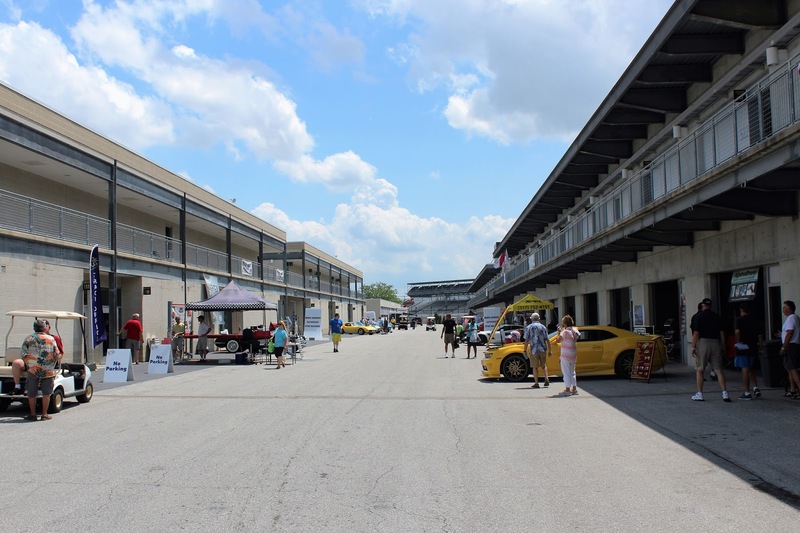 This was my first time on a track and first time doing "parade laps," which give you a chance to say you have driving on a famous racetrack but do not involve any danger. In fact, we drove to the Bloomington Gold show along the Interstate at higher speeds than I was permitted to drive on the legendary track! Three circuits were allowed and it was a memorable experience. 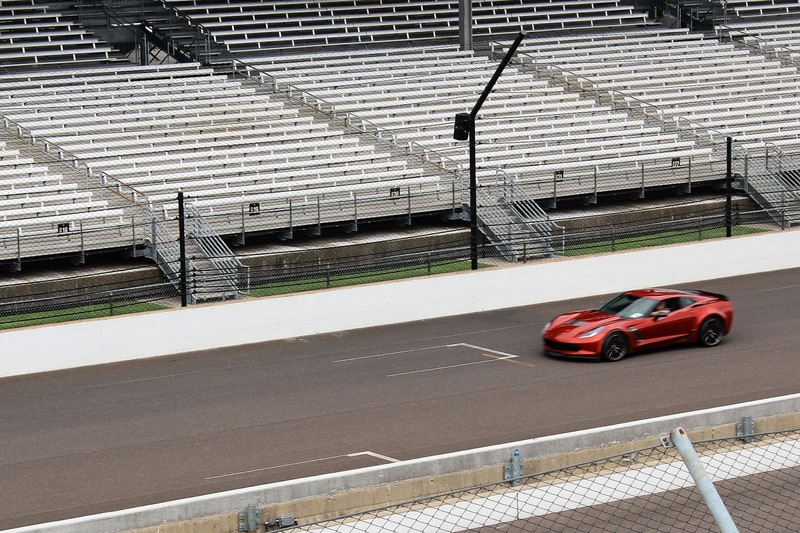 The first turn is probably the one with the sharpest banking but at 60 mph did not feel particularly exhilarating. By the way, the fastest lap ever turned at the Speedway was in 1996 at 239 mph. There was a photographer present and I have photos of me with the car crossing the line of bricks at the finish line. 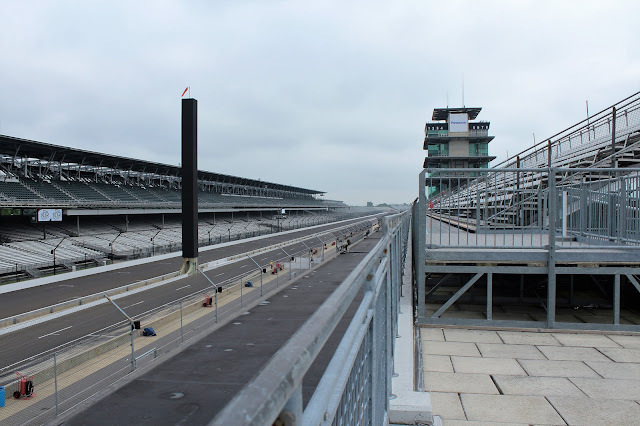 The track was originally bricked over in 1909 but in 1961 the last bricks were removed except for the symbolic row that remains. 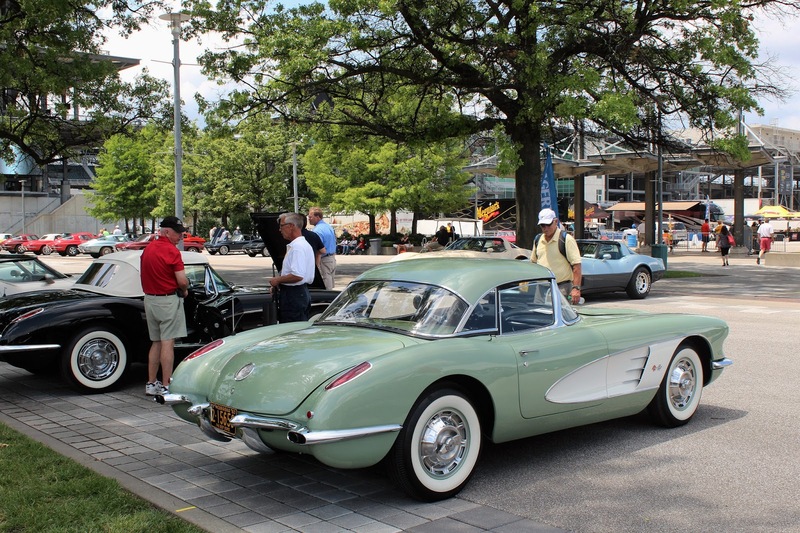 Of course, one of the main reasons for Bloomington Gold is the judging of cars whose owners are seeking the Bloomington Gold Certification. There were cars of the first four generations and were in amazing condition. 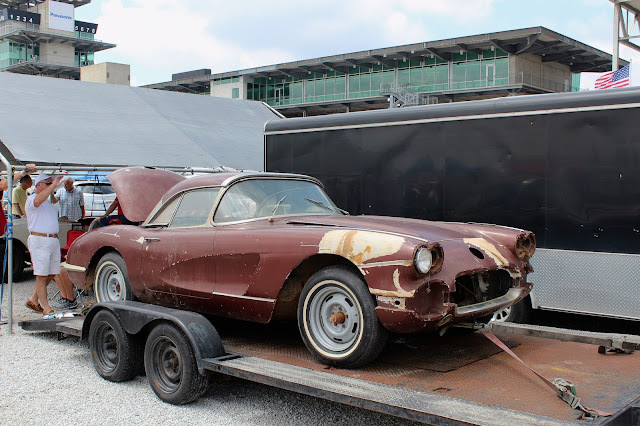 I did not see anything like a Survivor Class of original cars, or if they were there they were in such impeccable condition they did not need restoration. 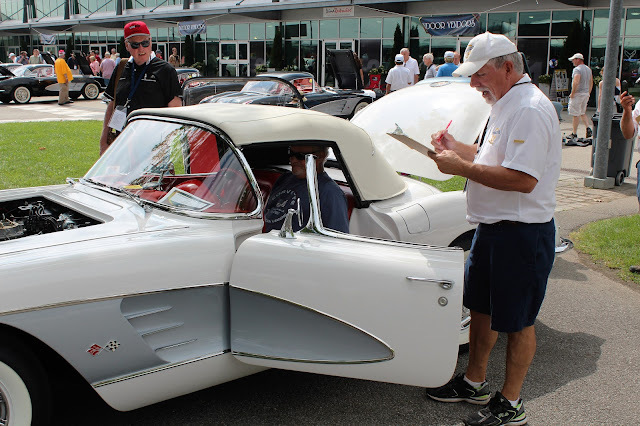 The judges, who wore white polo shirts and white baseball caps, descended en mass on each of the cars to be judged and went over them scrupulously, including checks of the all the mechanical and electrical systems. 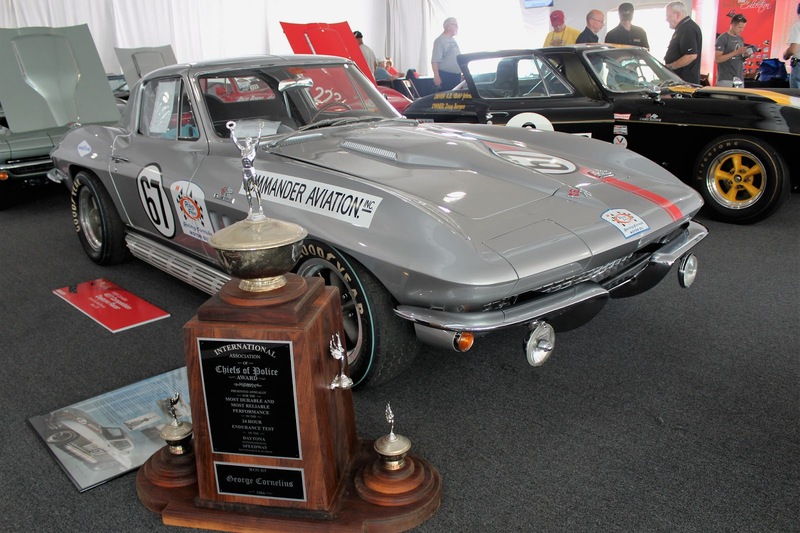 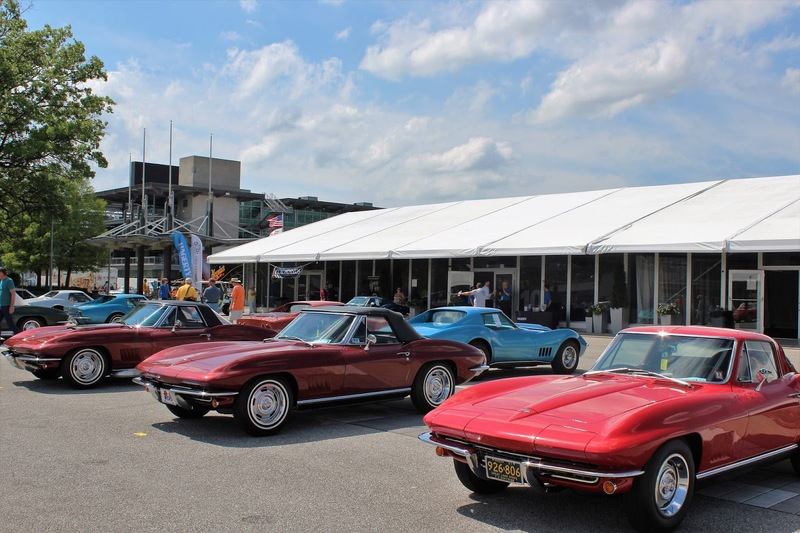 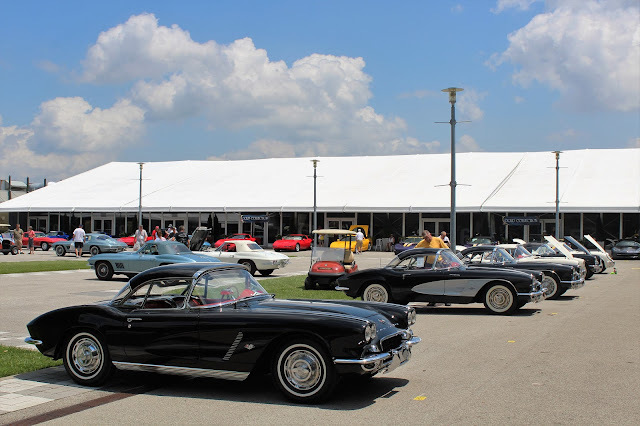 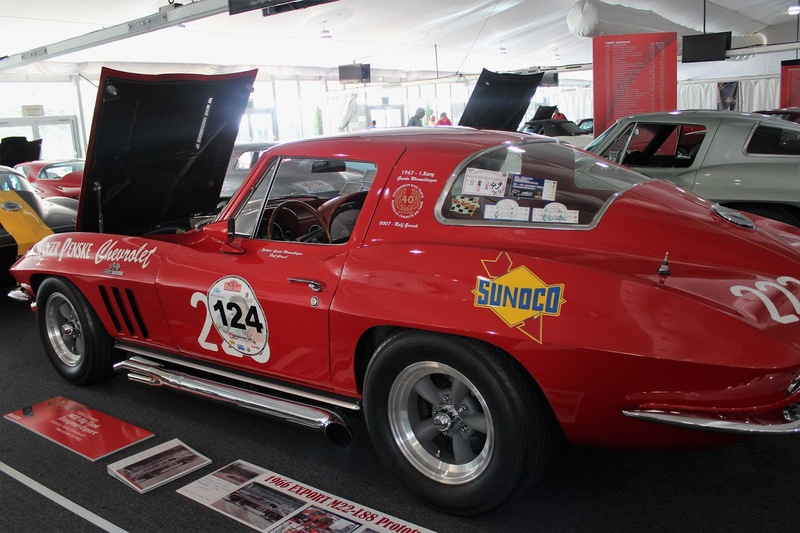 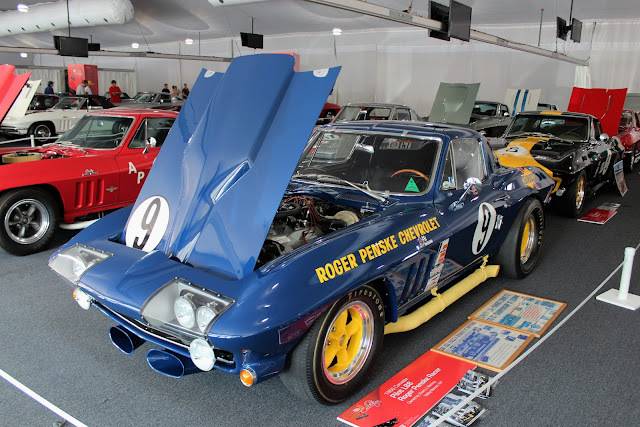 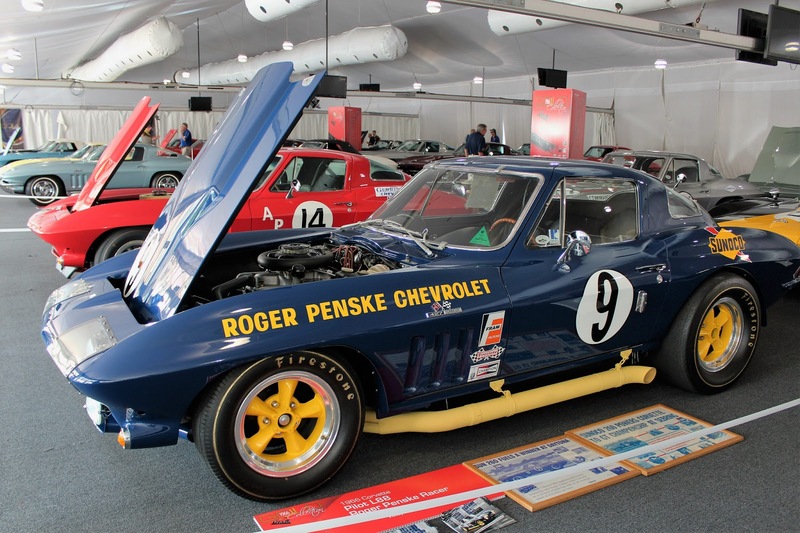 In a tent-like structure there was a special "Gold Collection" of midyear Corvettes (1963-1967), including a number of racing examples. 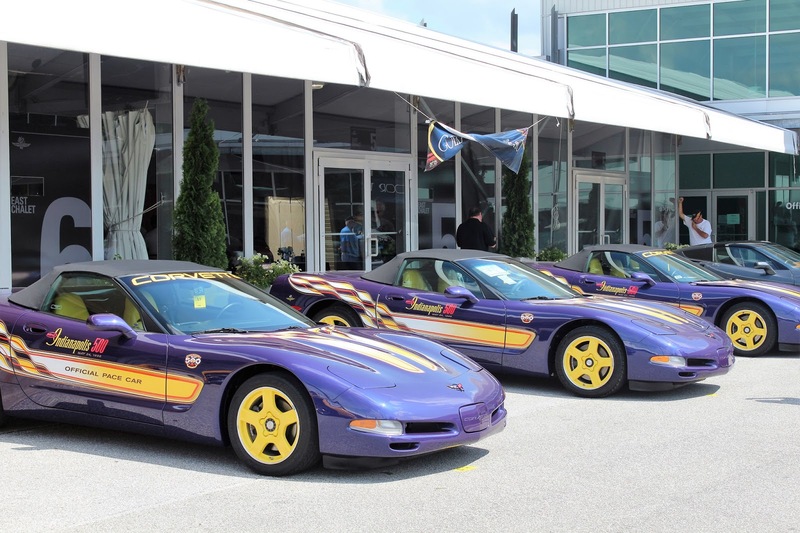 In front of the building were two rows to cars given special attention as well: 1996 Grand Sports, which were built in an edition of 1,000 cars to mark the end of C4 production; and the only C5s that I saw in the show area, the 1998 Indianapolis Pace Car edition in the very distinctive yellow-and-Radar Blue colour scheme. 1,158 of these cars were built and one of them at the show still had its original plastic seat covers as delivered to the dealer. 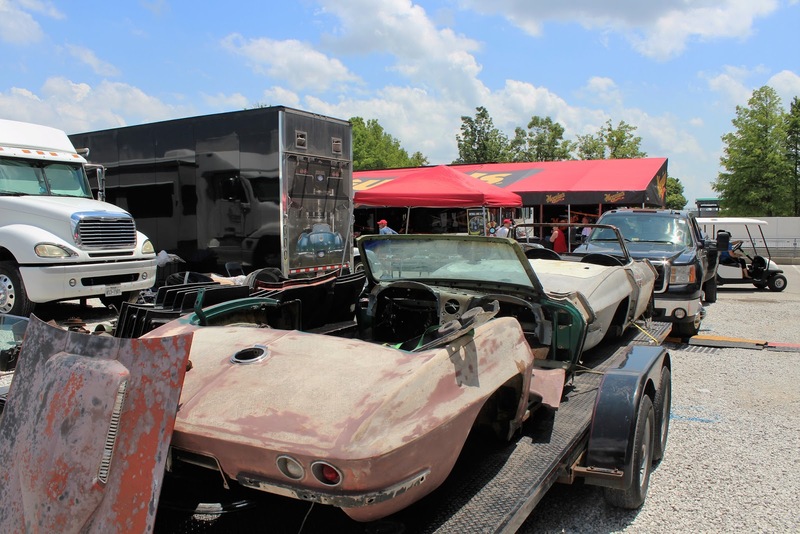 But not every car at Bloomington Gold was there to be judged for prizes for a meticulous restoration. To mark the 50th Anniversary of the car a special parking area was given over to 1966 Corvettes and many looked like they had been getting plenty of road use. 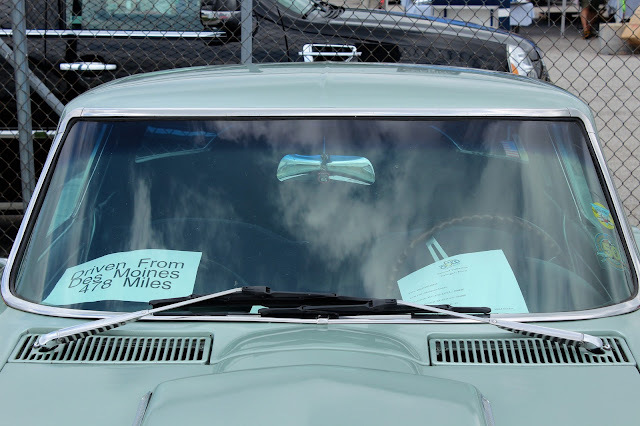 There was a club that had driven from Des Moines, Iowa, and one of the cars bore a sign that proudly said it had been driven 478 miles to get to the show. 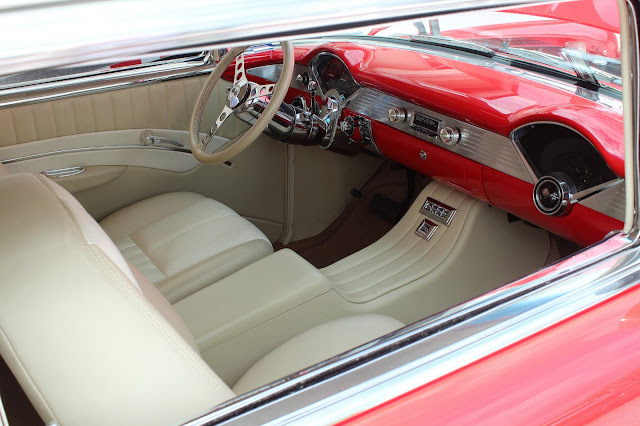 Not quite as far as from Ottawa, but our car is also not five decades old! 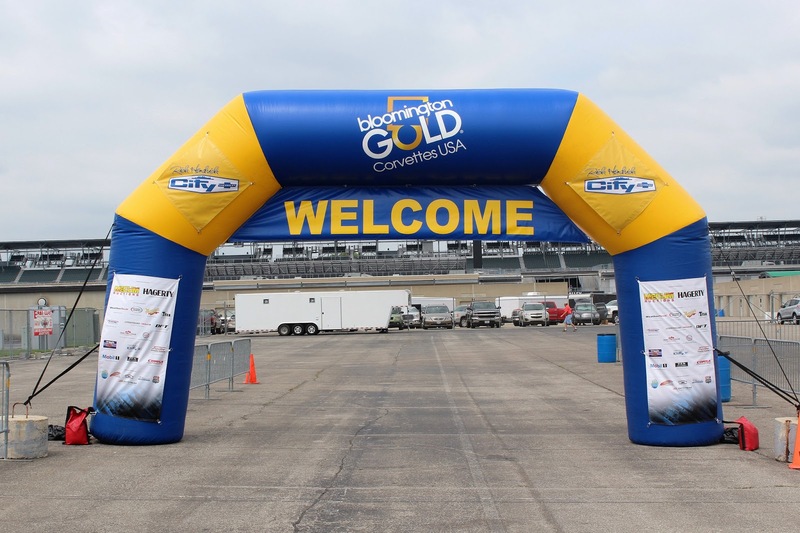 We enjoyed our time at the Speedway and the Bloomington Gold show and the two days we spent there went very quickly. 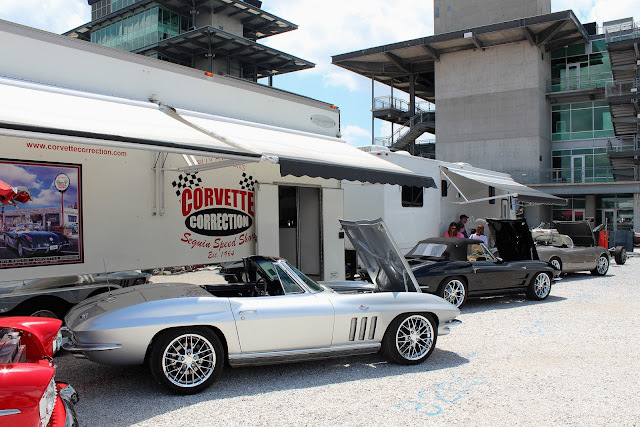 Taking our leave of the Simply Corvettes group, it was time to continue our own Corvette voyage.